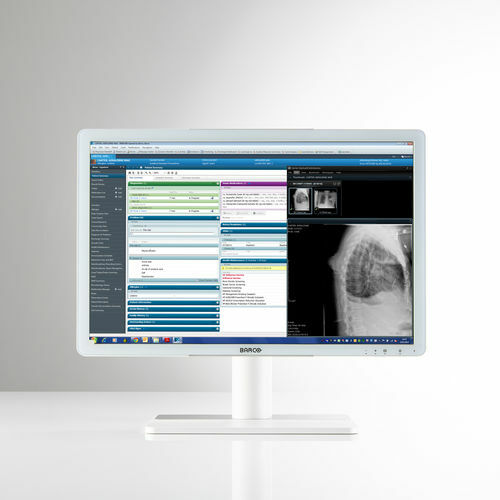 Eonis® 22” is a display built with healthcare specialists in mind. It combines consistent image quality and an attractive, versatile design with networked quality assurance. The white version features a front glass panel, making it exceptionally cleanable, even with 70% alcohol cleaning agents. Eonis presents sharp, bright images. The display’s unique front consistency sensor automatically aligns the image quality every time the display is switched on. The image consistency makes collaboration between specialists easier. They can discuss images with colleagues at multiple locations, knowing that everyone is seeing identical images. Eonis displays come with Barco’s cloud-based MediCal QAWeb software, an online service for automated calibration, Quality Assurance and asset management. Praised in hospitals around the world, MediCal QAWeb allows healthcare IT and PACS administrators to centrally and remotely manage image quality across the healthcare organization, at the click of a button.